Maize (/meɪz/ MAYZ; Zea mays subsp. mays, from Spanish: maíz after Taino: mahiz), also known as corn, is a cereal grain first domesticated by indigenous peoples in southern Mexico about 10,000 years ago. The leafy stalk of the plant produces pollen inflorescences and separate ovuliferous inflorescences called ears that yield kernels or seeds, which are fruits. Maize has become a staple food in many parts of the world, with the total production of maize surpassing that of wheat or rice. However, little of this maize is consumed directly by humans: most is used for corn ethanol, animal feed and other maize products, such as corn starch and corn syrup. The six major types of maize are dent corn, flint corn, pod corn, popcorn, flour corn, and sweet corn. Maize is the most widely grown grain crop throughout the Americas, with 361 million metric tons grown in the United States in 2014 (Production table). Approximately 40% of the crop—130 million tons—is used for corn ethanol. Genetically modified maize made up 85% of the maize planted in the United States in 2009. Sugar-rich varieties called sweet corn are usually grown for human consumption as kernels, while field corn varieties are used for animal feed, various corn-based human food uses (including grinding into cornmeal or masa, pressing into corn oil, and fermentation and distillation into alcoholic beverages like bourbon whiskey), and as chemical feedstocks. Maize is also used in making ethanol and other biofuels. Guilá Naquitz Cave in Oaxaca, Mexico is the site of early domestication of several food crops, including teosinte (an ancestor of maize). Most historians believe maize was domesticated in the Tehuacán Valley of Mexico. Recent research in the early 21st century has modified this view somewhat; scholars now indicate the adjacent Balsas River Valley of south-central Mexico as the center of domestication. An influential 2002 study by Matsuoka et al. has demonstrated that, rather than the multiple independent domestications model, all maize arose from a single domestication in southern Mexico about 9,000 years ago. The study also demonstrated that the oldest surviving maize types are those of the Mexican highlands. Later, maize spread from this region over the Americas along two major paths. This is consistent with a model based on the archaeological record suggesting that maize diversified in the highlands of Mexico before spreading to the lowlands. A large corpus of data indicates that it [maize] was dispersed into lower Central America by 7600 BP [5600 BC] and had moved into the inter-Andean valleys of Colombia between 7000 and 6000 BP [5000–4000 BC]. Since then, even earlier dates have been published. According to a genetic study by Embrapa, corn cultivation was introduced in South America from Mexico, in two great waves: the first, more than 6000 years ago, spread through the Andes. Evidence of cultivation in Peru has been found dating to about 6700 years ago. The second wave, about 2000 years ago, through the lowlands of South America. Before domestication, maize plants grew only small, 25 millimetres (1 in) long corn cobs, and only one per plant. In Spielvogel's view, many centuries of artificial selection (rather than the current view that maize was exploited by interplanting with teosinte) by the indigenous people of the Americas resulted in the development of maize plants capable of growing several cobs per plant, which were usually several centimetres/inches long each. The Olmec and Maya cultivated maize in numerous varieties throughout Mesoamerica; they cooked, ground and processed it through nixtamalization. It was believed that beginning about 2500 BC, the crop spread through much of the Americas. Research of the 21st century has established even earlier dates. The region developed a trade network based on surplus and varieties of maize crops. Mapuches of south-central Chile cultivated maize along with quinoa and potatoes in Pre-Hispanic times, however potato was the staple food of most Mapuches, "specially in the southern and coastal [Mapuche] territories where maize did not reach maturity". Before the expansion of the Inca Empire maize was traded and transported as far south as 40°19' S in Melinquina, Lácar Department. In that location maize remains were found inside pottery dated to 730 ±80 BP and 920 ±60 BP. Probably this maize was brought across the Andes from Chile. The presence of maize in Guaitecas Archipelago (43°55' S), which constitute southernmost outspost of Pre-Hispanic agriculture, is reported by early Spanish explorers. However the Spanish may have misidentified the plant. After the arrival of Europeans in 1492, Spanish settlers consumed maize and explorers and traders carried it back to Europe and introduced it to other countries. Spanish settlers far preferred wheat bread to maize, cassava, or potatoes. Maize flour could not be substituted for wheat for communion bread, since in Christian belief only wheat could undergo transubstantiation and be transformed into the body of Christ. Some Spaniards worried that by eating indigenous foods, which they did not consider nutritious, they would weaken and risk turning into Indians. "In the view of Europeans, it was the food they ate, even more than the environment in which they lived, that gave Amerindians and Spaniards both their distinctive physical characteristics and their characteristic personalities." Despite these worries, Spaniards did consume maize. Archeological evidence from Florida sites indicate they cultivated it as well. Maize spread to the rest of the world because of its ability to grow in diverse climates. It was cultivated in Spain just a few decades after Columbus's voyages and then spread to Italy, West Africa and elsewhere. Many small male flowers make up the male inflorescence, called the tassel. The word maize derives from the Spanish form of the indigenous Taíno word for the plant, mahiz. It is known by other names around the world. The word "corn" outside North America, Australia, and New Zealand refers to any cereal crop, its meaning understood to vary geographically to refer to the local staple. In the United States, Canada, Australia, and New Zealand, corn primarily means maize; this usage started as a shortening of "Indian corn". "Indian corn" primarily means maize (the staple grain of indigenous Americans), but can refer more specifically to multicolored "flint corn" used for decoration. In places outside North America, Australia, and New Zealand, corn often refers to maize in culinary contexts. The narrower meaning is usually indicated by some additional word, as in sweet corn, sweetcorn, corn on the cob, baby corn, the puffed confection known as popcorn and the breakfast cereal known as corn flakes. In Southern Africa, maize is commonly called mielie (Afrikaans) or mealie (English), words derived from the Portuguese word for maize, milho. Maize is preferred in formal, scientific, and international usage because it refers specifically to this one grain, unlike corn, which has a complex variety of meanings that vary by context and geographic region. Maize is used by agricultural bodies and research institutes such as the FAO and CSIRO. National agricultural and industry associations often include the word maize in their name even in English-speaking countries where the local, informal word is something other than maize; for example, the Maize Association of Australia, the Indian Maize Development Association, the Kenya Maize Consortium and Maize Breeders Network, the National Maize Association of Nigeria, the Zimbabwe Seed Maize Association. However, in commodities trading, corn consistently refers to maize and not other grains. The maize plant is often 3 m (10 ft) in height, though some natural strains can grow 13 m (43 ft). The stem is commonly composed of 20 internodes  of 18 cm (7.1 in) length. A leaf, which grows from each node, is generally 9 cm (4 in) in width and 120 cm (4 ft) in length. Ears develop above a few of the leaves in the midsection of the plant, between the stem and leaf sheath, elongating by around 3 millimetres (0.12 in) per day, to a length of 18 cm (7 in)  with 60 cm (24 in) being the maximum alleged in the subspecies. They are female inflorescences, tightly enveloped by several layers of ear leaves commonly called husks. Certain varieties of maize have been bred to produce many additional developed ears. These are the source of the "baby corn" used as a vegetable in Asian cuisine. Elongated stigmas, called silks, emerge from the whorl of husk leaves at the end of the ear. They are often pale yellow and 18 cm (7 in) in length, like tufts of hair in appearance. At the end of each is a carpel, which may develop into a "kernel" if fertilized by a pollen grain. The pericarp of the fruit is fused with the seed coat referred to as "caryopsis", typical of the grasses, and the entire kernel is often referred to as the "seed". The cob is close to a multiple fruit in structure, except that the individual fruits (the kernels) never fuse into a single mass. The grains are about the size of peas, and adhere in regular rows around a white, pithy substance, which forms the ear. The maximum size of kernels is reputedly 2.5 cm (1 in). An ear commonly holds 600 kernels. They are of various colors: blackish, bluish-gray, purple, green, red, white and yellow. When ground into flour, maize yields more flour with much less bran than wheat does. It lacks the protein gluten of wheat and, therefore, makes baked goods with poor rising capability. A genetic variant that accumulates more sugar and less starch in the ear is consumed as a vegetable and is called sweet corn. Young ears can be consumed raw, with the cob and silk, but as the plant matures (usually during the summer months), the cob becomes tougher and the silk dries to inedibility. By the end of the growing season, the kernels dry out and become difficult to chew without cooking them tender first in boiling water. Planting density affects multiple aspects of maize. Modern farming techniques in developed countries usually rely on dense planting, which produces one ear per stalk. Stands of silage maize are yet denser, and achieve a lower percentage of ears and more plant matter. Maize is a facultative short-day plant  and flowers in a certain number of growing degree days > 10 °C (50 °F) in the environment to which it is adapted. The magnitude of the influence that long nights have on the number of days that must pass before maize flowers is genetically prescribed and regulated by the phytochrome system. Photoperiodicity can be eccentric in tropical cultivars such that the long days characteristic of higher latitudes allow the plants to grow so tall that they do not have enough time to produce seed before being killed by frost. These attributes, however, may prove useful in using tropical maize for biofuels. Immature maize shoots accumulate a powerful antibiotic substance, 2,4-dihydroxy-7-methoxy-1,4-benzoxazin-3-one (DIMBOA). DIMBOA is a member of a group of hydroxamic acids (also known as benzoxazinoids) that serve as a natural defense against a wide range of pests, including insects, pathogenic fungi and bacteria. DIMBOA is also found in related grasses, particularly wheat. A maize mutant (bx) lacking DIMBOA is highly susceptible to attack by aphids and fungi. DIMBOA is also responsible for the relative resistance of immature maize to the European corn borer (family Crambidae). As maize matures, DIMBOA levels and resistance to the corn borer decline. Because of its shallow roots, maize is susceptible to droughts, intolerant of nutrient-deficient soils, and prone to be uprooted by severe winds. While yellow maizes derive their color from lutein and zeaxanthin, in red-colored maizes, the kernel coloration is due to anthocyanins and phlobaphenes. These latter substances are synthesized in the flavonoids synthetic pathway from polymerisation of flavan-4-ols by the expression of maize pericarp color1 (p1) gene which encodes an R2R3 myb-like transcriptional activator of the A1 gene encoding for the dihydroflavonol 4-reductase (reducing dihydroflavonols into flavan-4-ols) while another gene (Suppressor of Pericarp Pigmentation 1 or SPP1) acts as a suppressor. The p1 gene encodes an Myb-homologous transcriptional activator of genes required for biosynthesis of red phlobaphene pigments, while the P1-wr allele specifies colorless kernel pericarp and red cobs, and unstable factor for orange1 (Ufo1) modifies P1-wr expression to confer pigmentation in kernel pericarp, as well as vegetative tissues, which normally do not accumulate significant amounts of phlobaphene pigments. The maize P gene encodes a Myb homolog that recognizes the sequence CCT/AACC, in sharp contrast with the C/TAACGG bound by vertebrate Myb proteins. Maize flowers may sometimes exhibit mutations that lead to the formation of female flowers in the tassel. These mutations, ts4 and Ts6, prohibit the development of the stamen while simultaneously promoting pistil development. This may cause inflorescences containing both male and female flowers, or hermaphrodite flowers. Maize is an annual grass in the family Gramineae, which includes such plants as wheat, rye, barley, rice, sorghum, and sugarcane. There are two major species of the genus Zea (out of six total): Zea mays (maize) and Zea diploperennis, which is a perennial type of teosinte. The annual teosinte variety called Zea mays mexicana is the closest botanical relative to maize. It still grows in the wild as an annual in Mexico and Guatemala. Pod corn: Zea mays var. tunicata Larrañaga ex A. St. Hil. This system has been replaced (though not entirely displaced) over the last 60 years by multivariable classifications based on ever more data. Agronomic data were supplemented by botanical traits for a robust initial classification, then genetic, cytological, protein and DNA evidence was added. Now, the categories are forms (little used), races, racial complexes, and recently branches. Maize is a diploid with 20 chromosomes (n=10). The combined length of the chromosomes is 1500 cM. Some of the maize chromosomes have what are known as "chromosomal knobs": highly repetitive heterochromatic domains that stain darkly. Individual knobs are polymorphic among strains of both maize and teosinte. Barbara McClintock used these knob markers to validate her transposon theory of "jumping genes", for which she won the 1983 Nobel Prize in Physiology or Medicine. Maize is still an important model organism for genetics and developmental biology today. The Maize Genetics Cooperation Stock Center, funded by the USDA Agricultural Research Service and located in the Department of Crop Sciences at the University of Illinois at Urbana-Champaign, is a stock center of maize mutants. The total collection has nearly 80,000 samples. The bulk of the collection consists of several hundred named genes, plus additional gene combinations and other heritable variants. There are about 1000 chromosomal aberrations (e.g., translocations and inversions) and stocks with abnormal chromosome numbers (e.g., tetraploids). Genetic data describing the maize mutant stocks as well as myriad other data about maize genetics can be accessed at MaizeGDB, the Maize Genetics and Genomics Database. In 2005, the US National Science Foundation (NSF), Department of Agriculture (USDA) and the Department of Energy (DOE) formed a consortium to sequence the B73 maize genome. The resulting DNA sequence data was deposited immediately into GenBank, a public repository for genome-sequence data. Sequences and genome annotations have also been made available throughout the project's lifetime at the project's official site. Primary sequencing of the maize genome was completed in 2008. On November 20, 2009, the consortium published results of its sequencing effort in Science. The genome, 85% of which is composed of transposons, was found to contain 32,540 genes (By comparison, the human genome contains about 2.9 billion bases and 26,000 genes). Much of the maize genome has been duplicated and reshuffled by helitrons—group of rolling circle transposons. Maize reproduces sexually each year. This randomly selects half the genes from a given plant to propagate to the next generation, meaning that desirable traits found in the crop (like high yield or good nutrition) can be lost in subsequent generations unless certain techniques are used. Maize breeding in prehistory resulted in large plants producing large ears. Modern breeding began with individuals who selected highly productive varieties in their fields and then sold seed to other farmers. James L. Reid was one of the earliest and most successful developing Reid's Yellow Dent in the 1860s. These early efforts were based on mass selection. Later breeding efforts included ear to row selection (C. G. Hopkins c. 1896), hybrids made from selected inbred lines (G. H. Shull, 1909), and the highly successful double cross hybrids using four inbred lines (D. F. Jones c. 1918, 1922). University supported breeding programs were especially important in developing and introducing modern hybrids (Ref Jugenheimer Hybrid Maize Breeding and Seed Production pub. 1958). By the 1930s, companies such as Pioneer devoted to production of hybrid maize had begun to influence long term development. Internationally important seed banks such as the International Maize and Wheat Improvement Center (CIMMYT) and the US bank at the Maize Genetics Cooperation Stock Center University of Illinois at Urbana-Champaign maintain germplasm important for future crop development. Since the 1940s the best strains of maize have been first-generation hybrids made from inbred strains that have been optimized for specific traits, such as yield, nutrition, drought, pest and disease tolerance. Both conventional cross-breeding and genetic modification have succeeded in increasing output and reducing the need for cropland, pesticides, water and fertilizer. There is conflicting evidence to support the hypothesis that maize yield potential has increased over the past few decades. This suggests that changes in yield potential are associated with leaf angle, lodging resistance, tolerance of high plant density, disease/pest tolerance, and other agronomic traits rather than increase of yield potential per individual plant. CIMMYT operates a conventional breeding program to provide optimized strains. The program began in the 1980s. Hybrid seeds are distributed in Africa by the Drought Tolerant Maize for Africa project. Genetically modified (GM) maize was one of the 26 GM crops grown commercially in 2016. Grown since 1997 in the United States and Canada, 92% of the US maize crop was genetically modified in 2016 and 33% of the worldwide maize crop was GM in 2016. As of 2011, Herbicide-tolerant maize varieties were grown in Argentina, Australia, Brazil, Canada, China, Colombia, El Salvador, the European Union, Honduras, Japan, Korea, Malaysia, Mexico, New Zealand, Philippines, the Russian Federation, Singapore, South Africa, Taiwan, Thailand, and USA, and insect-resistant corn was grown in Argentina, Australia, Brazil, Canada, Chile, China, Colombia, Czech Republic, Egypt, the EU, Honduras, Japan, Korea, Malaysia, Mexico, Netherlands, New Zealand, Philippines, Romania, Russian Federation, South Africa, Switzerland, Taiwan, USA, and Uruguay. In September 2000, up to $50 million worth of food products were recalled due to the presence of Starlink genetically modified corn, which had been approved only for animal consumption and had not been approved for human consumption, and was subsequently withdrawn from the market. Maize is the domesticated variant of teosinte. The two plants have dissimilar appearance, maize having a single tall stalk with multiple leaves and teosinte being a short, bushy plant. The difference between the two is largely controlled by differences in just two genes. It is a direct domestication of a Mexican annual teosinte, Zea mays ssp. parviglumis, native to the Balsas River valley in south-eastern Mexico, with up to 12% of its genetic material obtained from Zea mays ssp. mexicana through introgression. This theory was further confirmed by the 2002 study of Matsuoka et al. It has been derived from hybridization between a small domesticated maize (a slightly changed form of a wild maize) and a teosinte of section Luxuriantes, either Z. luxurians or Z. diploperennis. It has evolved from a hybridization of Z. diploperennis by Tripsacum dactyloides. how domestication could have proceeded without leaving remains of teosinte or maize with teosintoid traits earlier than the earliest known until recently, dating from ca. 1100 BC. The domestication of maize is of particular interest to researchers—archaeologists, geneticists, ethnobotanists, geographers, etc. The process is thought by some to have started 7,500 to 12,000 years ago. Research from the 1950s to 1970s originally focused on the hypothesis that maize domestication occurred in the highlands between the states of Oaxaca and Jalisco, because the oldest archaeological remains of maize known at the time were found there. Genetic studies, published in 2004 by John Doebley, identified Zea mays ssp. parviglumis, native to the Balsas River valley in Mexico's southwestern highlands, and also known as Balsas teosinte, as being the crop wild relative teosinte genetically most similar to modern maize. This was confirmed by further studies, which refined this hypothesis somewhat. Archaeobotanical studies, published in 2009, point to the middle part of the Balsas River valley as the likely location of early domestication; this river is not very long, so these locations are not very distant. Stone milling tools with maize residue have been found in an 8,700 year old layer of deposits in a cave not far from Iguala, Guerrero. Stucco head of the Maya maize god, 550–850 AD. Doebley was part of the team that first published, in 2002, that maize had been domesticated only once, about 9,000 years ago, and then spread throughout the Americas. Maize pollen dated to 7,300 B.P. from San Andres, Tabasco, on the Caribbean coast has also been recovered. As maize was introduced to new cultures, new uses were developed and new varieties selected to better serve in those preparations. Maize was the staple food, or a major staple – along with squash, Andean region potato, quinoa, beans, and amaranth – of most pre-Columbian North American, Mesoamerican, South American, and Caribbean cultures. The Mesoamerican civilization, in particular, was deeply interrelated with maize. Its traditions and rituals involved all aspects of maize cultivation – from the planting to the food preparation. Maize formed the Mesoamerican people's identity. It is unknown what precipitated its domestication, because the edible portion of the wild variety is too small, and hard to obtain, to be eaten directly, as each kernel is enclosed in a very hard bivalve shell. In 1939, George Beadle demonstrated that the kernels of teosinte are readily "popped" for human consumption, like modern popcorn. Some have argued it would have taken too many generations of selective breeding to produce large, compressed ears for efficient cultivation. However, studies of the hybrids readily made by intercrossing teosinte and modern maize suggest this objection is not well founded. Around 4,500 B.P., maize began to spread to the north; it was first cultivated in what is now the United States at several sites in New Mexico and Arizona, about 4,100 B.P. During the first millennium AD, maize cultivation spread more widely in the areas north. In particular, the large-scale adoption of maize agriculture and consumption in eastern North America took place about A.D. 900. Native Americans cleared large forest and grassland areas for the new crop. In 2005, research by the USDA Forest Service suggested that the rise in maize cultivation 500 to 1,000 years ago in what is now the southeastern United States corresponded with a decline of freshwater mussels, which are very sensitive to environmental changes. Because it is cold-intolerant, in the temperate zones maize must be planted in the spring. Its root system is generally shallow, so the plant is dependent on soil moisture. As a plant that uses C4 carbon fixation, maize is a considerably more water-efficient crop than plants that use C3 carbon fixation such as alfalfa and soybeans. Maize is most sensitive to drought at the time of silk emergence, when the flowers are ready for pollination. In the United States, a good harvest was traditionally predicted if the maize was "knee-high by the Fourth of July", although modern hybrids generally exceed this growth rate. Maize used for silage is harvested while the plant is green and the fruit immature. Sweet corn is harvested in the "milk stage", after pollination but before starch has formed, between late summer and early to mid-autumn. Field maize is left in the field until very late in the autumn to thoroughly dry the grain, and may, in fact, sometimes not be harvested until winter or even early spring. The importance of sufficient soil moisture is shown in many parts of Africa, where periodic drought regularly causes maize crop failure and consequent famine. Although it is grown mainly in wet, hot climates, it has been said to thrive in cold, hot, dry or wet conditions, meaning that it is an extremely versatile crop. Maize was planted by the Native Americans in hills, in a complex system known to some as the Three Sisters. Maize provided support for beans, and the beans provided nitrogen derived from nitrogen-fixing rhizobia bacteria which live on the roots of beans and other legumes; and squashes provided ground cover to stop weeds and inhibit evaporation by providing shade over the soil. This method was replaced by single species hill planting where each hill 60–120 cm (2.0–3.9 ft) apart was planted with three or four seeds, a method still used by home gardeners. A later technique was "checked maize", where hills were placed 40 in (1.0 m) apart in each direction, allowing cultivators to run through the field in two directions. In more arid lands, this was altered and seeds were planted in the bottom of 10–12 cm (3.9–4.7 in) deep furrows to collect water. Modern technique plants maize in rows which allows for cultivation while the plant is young, although the hill technique is still used in the maize fields of some Native American reservations. When maize is planted in rows, it also allows for planting of other crops between these rows to make more efficient use of land space. In most regions today, maize grown in residential gardens is still often planted manually with a hoe, whereas maize grown commercially is no longer planted manually but rather is planted with a planter. In North America, fields are often planted in a two-crop rotation with a nitrogen-fixing crop, often alfalfa in cooler climates and soybeans in regions with longer summers. Sometimes a third crop, winter wheat, is added to the rotation. Many of the maize varieties grown in the United States and Canada are hybrids. Often the varieties have been genetically modified to tolerate glyphosate or to provide protection against natural pests. Glyphosate is an herbicide which kills all plants except those with genetic tolerance. This genetic tolerance is very rarely found in nature. In the midwestern United States, low-till or no-till farming techniques are usually used. In low-till, fields are covered once, maybe twice, with a tillage implement either ahead of crop planting or after the previous harvest. The fields are planted and fertilized. Weeds are controlled through the use of herbicides, and no cultivation tillage is done during the growing season. This technique reduces moisture evaporation from the soil, and thus provides more moisture for the crop. The technologies mentioned in the previous paragraph enable low-till and no-till farming. Weeds compete with the crop for moisture and nutrients, making them undesirable. Hand-picking harvest of maize in Myanmar. Before the 20th century, all maize harvesting was by manual labour, by grazing, or by some combination of those. Whether the ears were hand-picked and the stover was grazed, or the whole plant was cut, gathered, and shocked, people and livestock did all the work. Between the 1890s and the 1970s, the technology of maize harvesting expanded greatly. Today, all such technologies, from entirely manual harvesting to entirely mechanized, are still in use to some degree, as appropriate to each farm's needs, although the thoroughly mechanized versions predominate, as they offer the lowest unit costs when scaled to large farm operations. For small farms, their unit cost can be too high, as their higher fixed cost cannot be amortized over as many units. Before World War II, most maize in North America was harvested by hand. This involved a large numbers of workers and associated social events (husking or shucking bees). From the 1890s onward, some machinery became available to partially mechanize the processes, such as one- and two-row mechanical pickers (picking the ear, leaving the stover) and corn binders, which are reaper-binders designed specifically for maize (for example, Video on YouTube). The latter produce sheaves that can be shocked. By hand or mechanical picker, the entire ear is harvested, which then requires a separate operation of a maize sheller to remove the kernels from the ear. Whole ears of maize were often stored in corn cribs, and these whole ears are a sufficient form for some livestock feeding use. Today corn cribs with whole ears, and corn binders, are less common because most modern farms harvest the grain from the field with a combine and store it in bins. The combine with a corn head (with points and snap rolls instead of a reel) does not cut the stalk; it simply pulls the stalk down. The stalk continues downward and is crumpled into a mangled pile on the ground, where it usually is left to become organic matter for the soil. The ear of maize is too large to pass between slots in a plate as the snap rolls pull the stalk away, leaving only the ear and husk to enter the machinery. The combine separates out the husk and the cob, keeping only the kernels. When maize is a silage crop, the entire plant is usually chopped at once with a forage harvester (chopper) and ensiled in silos or polymer wrappers. Ensiling of sheaves cut by a corn binder was formerly common in some regions but has become uncommon. For storing grain in bins, the moisture of the grain must be sufficiently low to avoid spoiling. If the moisture content of the harvested grain is too high, grain dryers are used to reduce the moisture content by blowing heated air through the grain. This can require large amounts of energy in the form of combustible gases (propane or natural gas) and electricity to power the blowers. Maize is widely cultivated throughout the world, and a greater weight of maize is produced each year than any other grain. In 2014, total world production was 1.04 billion tonnes, led by the United States with 35% of the total (table). China produced 21% of the global total. In 2016, maize (corn) production was forecast to be over 15 billion bushels, an increase of 11% over 2014 American production. Based on conditions as of August 2016, the expected yield would be the highest ever for the United States. The area of harvested maize was forecast to be 87 million acres, an increase of 7% over 2015. Maize is especially popular in Midwestern states such as Indiana and Illinois; in the latter, it was named the state's official grain in 2017. Fall armyworm (Spodoptera frugiperda) Some sweet corn varieties have developed partial resistance to fall army worms by producing a unique 33-kD proteinase that significantly retards fall army worm growth. The susceptibility of maize to the European corn borer and corn rootworms, and the resulting large crop losses which are estimated at a billion dollars worldwide for each pest, led to the development of transgenics expressing the Bacillus thuringiensis toxin. "Bt maize" is widely grown in the United States and has been approved for release in Europe. Maize being toasted over an open flame in India. Maize and cornmeal (ground dried maize) constitute a staple food in many regions of the world. Maize is central to Mexican food. Virtually every dish in Mexican cuisine uses maize. In the form of grain or cornmeal, maize is the main ingredient of tortillas, tamales, pozole, atole and all the dishes based on them, like tacos, quesadillas, chilaquiles, enchiladas, tostadas and many more. In Mexico even a fungus of maize, known as huitlacoche is considered a delicacy. Introduced into Africa by the Portuguese in the 16th century, maize has become Africa's most important staple food crop. Maize meal is made into a thick porridge in many cultures: from the polenta of Italy, the angu of Brazil, the mămăligă of Romania, to cornmeal mush in the US (and hominy grits in the South) or the food called mealie pap in South Africa and sadza, nshima and ugali in other parts of Africa. Maize meal is also used as a replacement for wheat flour, to make cornbread and other baked products. Masa (cornmeal treated with limewater) is the main ingredient for tortillas, atole and many other dishes of Central American food. Popcorn consists of kernels of certain varieties that explode when heated, forming fluffy pieces that are eaten as a snack. Roasted dried maize ears with semihardened kernels, coated with a seasoning mixture of fried chopped spring onions with salt added to the oil, is a popular snack food in Vietnam. Cancha, which are roasted maize chulpe kernels, are a very popular snack food in Peru, and also appears in traditional Peruvian ceviche. An unleavened bread called makki di roti is a popular bread eaten in the Punjab region of India and Pakistan. Chicha and chicha morada (purple chicha) are drinks typically made from particular types of maize. The first one is fermented and alcoholic, the second is a soft drink commonly drunk in Peru. Corn flakes are a common breakfast cereal in North America and the United Kingdom, and found in many other countries all over the world. 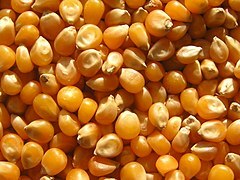 Maize can also be prepared as hominy, in which the kernels are soaked with lye in a process called nixtamalization; or grits, which are coarsely ground hominy. These are commonly eaten in the Southeastern United States, foods handed down from Native Americans, who called the dish sagamite. The Brazilian dessert canjica is made by boiling maize kernels in sweetened milk. Maize can also be harvested and consumed in the unripe state, when the kernels are fully grown but still soft. Unripe maize must usually be cooked to become palatable; this may be done by simply boiling or roasting the whole ears and eating the kernels right off the cob. Sweet corn, a genetic variety that is high in sugars and low in starch, is usually consumed in the unripe state. Such corn on the cob is a common dish in the United States, Canada, United Kingdom, Cyprus, some parts of South America, and the Balkans, but virtually unheard of in some European countries. Corn on the cob was hawked on the streets of early 19th-century New York City by poor, barefoot "Hot Corn Girls", who were thus the precursors of hot dog carts, churro wagons, and fruit stands seen on the streets of big cities today. The cooked, unripe kernels may also be shaved off the cob and served as a vegetable in side dishes, salads, garnishes, etc. Alternatively, the raw unripe kernels may also be grated off the cobs and processed into a variety of cooked dishes, such as maize purée, tamales, pamonhas, curau, cakes, ice creams, etc. Maize is a major source of starch. Cornstarch (maize flour) is a major ingredient in home cooking and in many industrialized food products. Maize is also a major source of cooking oil (corn oil) and of maize gluten. Maize starch can be hydrolyzed and enzymatically treated to produce syrups, particularly high fructose corn syrup, a sweetener; and also fermented and distilled to produce grain alcohol. Grain alcohol from maize is traditionally the source of Bourbon whiskey. Maize is sometimes used as the starch source for beer. Within the United States, the usage of maize for human consumption constitutes about 1/40th of the amount grown in the country. In the United States and Canada, maize is mostly grown to feed livestock, as forage, silage (made by fermentation of chopped green cornstalks), or grain. Maize meal is also a significant ingredient of some commercial animal food products, such as dog food. Raw, yellow, sweet maize kernels are composed of 76% water, 19% carbohydrates, 3% protein, and 1% fat (table). In a 100-gram serving, maize kernels provide 86 calories and are a good source (10-19% of the Daily Value) of the B vitamins, thiamin, niacin (but see Pellagra warning below), pantothenic acid (B5) and folate (right table for raw, uncooked kernels, USDA Nutrient Database). In moderate amounts, they also supply dietary fiber and the essential minerals, magnesium and phosphorus whereas other nutrients are in low amounts (table). Maize has suboptimal amounts of the essential amino acids tryptophan and lysine, which accounts for its lower status as a protein source. The indigenous Americans overcame this deficiency with the inclusion of beans in their diet. Maize is a major source of both grain feed and fodder for livestock. It is fed to the livestock in various ways. When it is used as a grain crop, the dried kernels are used as feed. They are often kept on the cob for storage in a corn crib, or they may be shelled off for storage in a grain bin. The farm that consumes the feed may produce it, purchase it on the market, or some of both. When the grain is used for feed, the rest of the plant (the corn stover) can be used later as fodder, bedding (litter), or soil amendment. When the whole maize plant (grain plus stalks and leaves) is used for fodder, it is usually chopped all at once and ensilaged, as digestibility and palatability are higher in the ensilaged form than in the dried form. Maize silage is one of the most valuable forages for ruminants. Before the advent of widespread ensilaging, it was traditional to gather the corn into shocks after harvesting, where it dried further. With or without a subsequent move to the cover of a barn, it was then stored for weeks to several months until fed to the livestock. Today ensilaging can occur not only in siloes but also in silage wrappers. However, in the tropics maize can be harvested year-round and fed as green forage to the animals. Starch from maize can also be made into plastics, fabrics, adhesives, and many other chemical products. The corn steep liquor, a plentiful watery byproduct of maize wet milling process, is widely used in the biochemical industry and research as a culture medium to grow many kinds of microorganisms. Chrysanthemin is found in purple corn and is used as a food coloring. "Feed maize" is being used increasingly for heating; specialized corn stoves (similar to wood stoves) are available and use either feed maize or wood pellets to generate heat. Maize cobs are also used as a biomass fuel source. Maize is relatively cheap and home-heating furnaces have been developed which use maize kernels as a fuel. They feature a large hopper that feeds the uniformly sized maize kernels (or wood pellets or cherry pits) into the fire. Maize is increasingly used as a feedstock for the production of ethanol fuel. When considering where to construct an ethanol plant, one of the site selection criteria is to ensure there is locally available feedstock. Ethanol is mixed with gasoline to decrease the amount of pollutants emitted when used to fuel motor vehicles. High fuel prices in mid-2007 led to higher demand for ethanol, which in turn led to higher prices paid to farmers for maize. This led to the 2007 harvest being one of the most profitable maize crops in modern history for farmers. Because of the relationship between fuel and maize, prices paid for the crop now tend to track the price of oil. The price of food is affected to a certain degree by the use of maize for biofuel production. The cost of transportation, production, and marketing are a large portion (80%) of the price of food in the United States. Higher energy costs affect these costs, especially transportation. The increase in food prices the consumer has been seeing is mainly due to the higher energy cost. The effect of biofuel production on other food crop prices is indirect. Use of maize for biofuel production increases the demand, and therefore price of maize. This, in turn, results in farm acreage being diverted from other food crops to maize production. This reduces the supply of the other food crops and increases their prices. Maize is widely used in Germany as a feedstock for biogas plants. Here the maize is harvested, shredded then placed in silage clamps from which it is fed into the biogas plants. This process makes use of the whole plant rather than simply using the kernels as in the production of fuel ethanol. A biomass gasification power plant in Strem near Güssing, Burgenland, Austria, began in 2005. Research is being done to make diesel out of the biogas by the Fischer Tropsch method. Increasingly, ethanol is being used at low concentrations (10% or less) as an additive in gasoline (gasohol) for motor fuels to increase the octane rating, lower pollutants, and reduce petroleum use (what is nowadays also known as "biofuels" and has been generating an intense debate regarding the human beings' necessity of new sources of energy, on the one hand, and the need to maintain, in regions such as Latin America, the food habits and culture which has been the essence of civilizations such as the one originated in Mesoamerica; the entry, January 2008, of maize among the commercial agreements of NAFTA has increased this debate, considering the bad labor conditions of workers in the fields, and mainly the fact that NAFTA "opened the doors to the import of maize from the United States, where the farmers who grow it receive multimillion dollar subsidies and other government supports. ... According to OXFAM UK, after NAFTA went into effect, the price of maize in Mexico fell 70% between 1994 and 2001. The number of farm jobs dropped as well: from 8.1 million in 1993 to 6.8 million in 2002. Many of those who found themselves without work were small-scale maize growers."). However, introduction in the northern latitudes of the US of tropical maize for biofuels, and not for human or animal consumption, may potentially alleviate this. As a result of the US federal government announcing its production target of 35 billion US gallons (130,000,000 m3) of biofuels by 2017, ethanol production will grow to 7 billion US gallons (26,000,000 m3) by 2010, up from 4.5 billion in 2006, boosting ethanol's share of maize demand in the US from 22.6 percent to 36.1 percent. Maize is bought and sold by investors and price speculators as a tradable commodity using corn futures contracts. These "futures" are traded on the Chicago Board of Trade (CBOT) under ticker symbol C. They are delivered every year in March, May, July, September, and December. Some forms of the plant are occasionally grown for ornamental use in the garden. For this purpose, variegated and colored leaf forms as well as those with colorful ears are used. Corncobs can be hollowed out and treated to make inexpensive smoking pipes, first manufactured in the United States in 1869. An unusual use for maize is to create a "corn maze" (or "maize maze") as a tourist attraction. The idea of a maize maze was introduced by the American Maze Company who created a maze in Pennsylvania in 1993. Traditional mazes are most commonly grown using yew hedges, but these take several years to mature. The rapid growth of a field of maize allows a maze to be laid out using GPS at the start of a growing season and for the maize to grow tall enough to obstruct a visitor's line of sight by the start of the summer. In Canada and the US, these are popular in many farming communities. Maize kernels can be used in place of sand in a sandboxlike enclosure for children's play. 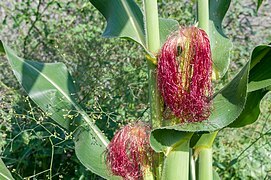 Stigmas from female maize flowers, popularly called corn silk, are sold as herbal supplements. Maize is used as a fish bait, called "dough balls". It is particularly popular in Europe for coarse fishing. Additionally, feed corn is sometimes used by hunters to bait animals such as deer or wild hogs. The breakdown of usage of the 12.1-billion-bushel (307-million-tonne) 2008 US maize crop was as follows, according to the World Agricultural Supply and Demand Estimates Report by the USDA. In the US since 2009/2010, maize feedstock use for ethanol production has somewhat exceeded direct use for livestock feed; maize use for fuel ethanol was 5,130 million bushels (130 million tonnes) in the 2013/2014 marketing year. A fraction of the maize feedstock dry matter used for ethanol production is usefully recovered as DDGS (dried distillers grains with solubles). In the 2010/2011 marketing year, about 29.1 million tonnes of DDGS were fed to US livestock and poultry. Because starch utilization in fermentation for ethanol production leaves other grain constituents more concentrated in the residue, the feed value per kg of DDGS, with regard to ruminant-metabolizable energy and protein, exceeds that of the grain. Feed value for monogastric animals, such as swine and poultry, is somewhat lower than for ruminants. The following table shows the nutrient content of maize and major staple foods in a raw harvested form. Raw forms are not edible and cannot be digested. These must be sprouted, or prepared and cooked for human consumption. In sprouted or cooked form, the relative nutritional and anti-nutritional contents of each of these staples are different from that of raw form of these staples reported in the table below. When maize was first introduced into farming systems other than those used by traditional native-American peoples, it was generally welcomed with enthusiasm for its productivity. However, a widespread problem of malnutrition soon arose wherever maize was introduced as a staple food. This was a mystery, since these types of malnutrition were not normally seen among the indigenous Americans, for whom maize was the principal staple food. It was eventually discovered that the indigenous Americans had learned to soak maize in alkali-water (the process now known as nixtamalization) —made with ashes and lime (calcium oxide) since at least 1200–1500 BC by Mesoamericans and North Americans—which liberates the B-vitamin niacin, the lack of which was the underlying cause of the condition known as pellagra. Maize was introduced into the diet of non-indigenous Americans without the necessary cultural knowledge acquired over thousands of years in the Americas. In the late 19th century, pellagra reached epidemic proportions in parts of the southern US, as medical researchers debated two theories for its origin: the deficiency theory (which was eventually shown to be true) said that pellagra was due to a deficiency of some nutrient, and the germ theory said that pellagra was caused by a germ transmitted by stable flies. A third theory, promoted by the eugenicist Charles Davenport, held that people only contracted pellagra if they were susceptible to it due to certain "constitutional, inheritable" traits of the affected individual. Once alkali processing and dietary variety were understood and applied, pellagra disappeared in the developed world. The development of high lysine maize and the promotion of a more balanced diet have also contributed to its demise. Pellagra still exists today in food-poor areas and refugee camps where people survive on donated maize. Maize contains lipid transfer protein, an indigestible protein that survives cooking. This protein has been linked to a rare and understudied allergy to maize in humans. The allergic reaction can cause skin rash, swelling or itching of mucous membranes, diarrhea, vomiting, asthma and, in severe cases, anaphylaxis. It is unclear how common this allergy is in the general population. Maize has been an essential crop in the Andes since the pre-Columbian era. The Moche culture from Northern Peru made ceramics from earth, water, and fire. This pottery was a sacred substance, formed in significant shapes and used to represent important themes. Maize was represented anthropomorphically as well as naturally. In the United States, maize ears along with tobacco leaves are carved into the capitals of columns in the United States Capitol building. Maize itself is sometimes used for temporary architectural detailing when the intent is to celebrate the fall season, local agricultural productivity and culture. Bundles of dried maize stalks are often displayed often along with pumpkins, gourds and straw in autumnal displays outside homes and businesses. A well-known example of architectural use is the Corn Palace in Mitchell, South Dakota, which uses cobs and ears of colored maize to implement a mural design that is recycled annually. Another well known example is the Field of Corn in Dublin, Ohio, where hundreds of concrete ears of corn lay in a grassy field. A maize stalk with two ripe ears is depicted on the reverse of the Croatian 1 lipa coin, minted since 1993. ^ "The Evolution of Corn". University of Utah HEALTH SCIENCES. Retrieved 2 January 2016. ^ Benz, B. F. (2001). "Archaeological evidence of teosinte domestication from Guilá Naquitz, Oaxaca". Proceedings of the National Academy of Sciences. 98 (4): 2104–2106. Bibcode:2001PNAS...98.2104B. doi:10.1073/pnas.98.4.2104. PMC 29389. PMID 11172083. Retrieved 2 April 2018. ^ "Please settle a dispute. Is sweet corn a vegetable or a grain? What is the difference? How about field corn? - eXtension". USDA National Institute of Food and Agriculture, New Technologies for Ag Extension project. Retrieved 2018-08-03. ^ Foley, Jonathon. "It's Time to Rethink America's Corn System". Scientific American. Retrieved 18 February 2019. ^ Linda Campbell Franklin, "Corn," in Andrew F. Smith (ed. ), The Oxford Encyclopedia of Food and Drink in America. 2nd ed. Oxford: Oxford University Press, 2013 (pp. 551–558), p. 553. ^ "US Approves Corn Modified for Ethanol". The New York Times. February 11, 2011. ^ Benz, Bruce F. (2005). "Archaeological evidence of teosinte domestication from Guilá Naquitz, Oaxaca". Proceedings of the National Academy of Sciences. 98 (4): 2104–2106. doi:10.1073/pnas.98.4.2104. JSTOR 3055008. PMC 29389. PMID 11172083. ^ "Origin, History and Uses of Corn". Iowa State University, Department of Agronomy. February 11, 2014. Archived from the original on February 23, 2014. ^ a b c Matsuoka, Y.; Vigouroux, Y.; Goodman, M. M.; et al. (2002). "A single domestication for maize shown by multilocus microsatellite genotyping". Proceedings of the National Academy of Sciences. 99 (9): 6080–4. Bibcode:2002PNAS...99.6080M. doi:10.1073/pnas.052125199. PMC 122905. PMID 11983901. ^ Matsuoka,, Yoshihiro (22 January 2003). "Earliest Directional Evolution for Microsatellite Size in Maize" (PDF). Science. Retrieved 3 March 2014. ^ Pagán-Jiménez, Jaime R.; Guachamín-Tello, Ana M.; Romero-Bastidas, Martha E.; Constantine-Castro, Angelo R. (2015). "Late ninth millennium B.P. use of Zea mays L. at Cubilán area, highland Ecuador, revealed by ancient starches". Quaternary International. 404: 137–155. Bibcode:2016QuInt.404..137P. doi:10.1016/j.quaint.2015.08.025. ISSN 1040-6182. ^ "Los antiguos peruanos comían palomitas de maíz". BBC Mundo. BBC. 19 Jan 2012. ^ "Did man follow plants or did plants follow man? Tracks of prehistoric man and ways of contact in the Americas according to cultivated plants. Case study – Maize (translated from Portuguese)". Yumpu. 2015. Retrieved October 13, 2015. ^ Spielvogel, Jackson J. (1 March 2005). Medieval and Early Modern Times: Discovering Our Past. Glencoe/McGraw-Hill School Publishing Company. ISBN 978-0-07-868876-8. ^ a b Roney, John (Winter 2009). "The Beginnings of Maize Agriculture". Archaeology Southwest. 23 (1): 4. ^ Bengoa, José (2003). Historia de los antiguos mapuches del sur (in Spanish). Santiago: Catalonia. pp. 199–200. ISBN 956-8303-02-2. ^ a b Pérez, Alberto E.; Erra, Georgina (2011). "Identificación de maiz de vasijas recuperadas de la Patagonia noroccidental argentina" [Identifying maize residues in pottery vessels in northwestern Patagonia, Argentina]. Magallania (in Spanish). 39 (2): 309–316. doi:10.4067/S0718-22442011000200022. Retrieved February 12, 2019. ^ Bird, Junius (1946). "The Alacaluf". In Steward, Julian H. Handbook of South American Indians. Bulletin 143. I. –Bureau of American Ethnology. pp. 55–79. ^ a b Torrejón, Fernando; Bizama, Fernando; Araneda, Alberto; Aguayo, Mauricio; Bertrand, Sébastien; Urrutia, Roberto (2013). "Descifrando la historia ambiental de los archipiélagos de Aysén, Chile: El influjo colonial y la explotación económica-mercantil republicana (siglos XVI-XIX)" [Deciphering the environmental history of the Aysén archipelagos, Chile: Colonial influence and commercial exploitation during the Republican Era (XVI-XIX centuries)]. Magallania (in Spanish). 41 (1). doi:10.4067/S0718-22442013000100002. Retrieved December 11, 2018. ^ Rebecca Earle, The Body of the Conquistador: Food, Race, and the Colonial Experience in Spanish America, 1492–1700. New York: Cambridge University Press 2012, pp. 17, 151. ^ Earle, The Body of the Conquistador, p. 5. ^ a b Earle, The Body of the Conquistador, p. 144. ^ "maize". Oxford English Dictionary, online edition. 2012. Accessed June 7, 2012. ^ a b c "corn". Oxford English Dictionary, online edition. 2012. Accessed June 7, 2012. ^ a b Ensminger, Audrey H. (1994). Foods and Nutrition Encyclopedia, 2nd ed. CRC Press. p. 479. ISBN 978-0-8493-8980-1. The word "maize" is preferred in international usage because in many countries the term "corn", the name by which the plant is known in the United States, is synonymous with the leading cereal grain; thus, in England "corn" refers to wheat, and in Scotland and Ireland it refers to oats. ^ Boberg, Charles (2010). The English Language in Canada: Status, History and Comparative Analysis. Cambridge University Press. p. 109. ISBN 978-1-139-49144-0. ^ Rhodes, L. L.; Eagles, H. A. (1984). "Origins of maize in New Zealand". New Zealand Journal of Agricultural Research. 27 (2): 151–156. doi:10.1080/00288233.1984.10430414. ^ "mealie", Oxford English Dictionary, online edition, 2012. Accessed June 7, 2012. ^ a b c Wellhausen, Edwin John (1952). Races of Maize in Mexico. ^ Karl, J.R. (Jan 2012). "The Maximum Leaf Number of the Maize Subspecies" (PDF). The Maize Genetics Cooperation Newsletter. 86: 4. ISSN 1090-4573. Archived from the original (PDF) on March 3, 2016. Retrieved July 5, 2013. ^ Stevenson, J. C.; Goodman, M. M. (1972). "Ecology of Exotic Races of Maize. I. Leaf Number and Tillering of 16 Races Under Four Temperatures and Two Photoperiods1". Crop Science. 12 (6): 864. doi:10.2135/cropsci1972.0011183X001200060045x. ^ Karl, J. R. (2007). "Jala Maize is Small" (PDF). Maize Genetics MNL. 89: e3. Archived from the original (PDF) on August 8, 2017. Retrieved November 19, 2015. ^ Grobman, Alexander (1961). Races of Maize in Peru. ^ Gautam, P.; Gustafson, DM; Wicks III, Z (2011). "Phosphorus Concentration, Uptake and Dry Matter Yield of Corn Hybrids" (PDF). World Journal of Agricultural Sciences. 7 (4): 418–424. ISSN 1817-3047. ^ Karl, J.R. (Jan 2002). "Maize is Not Day Neutral; Day Length and Flowering" (PDF). The Maize Genetics Cooperation Newsletter. 89: e7. Archived from the original (PDF) on August 8, 2017. Retrieved September 6, 2015. ^ Paliwal, R. L (2000). Tropical maize: Improvement and production. ISBN 9789251044575. ^ "Unique gene combinations control tropical maize response to day lengths". Eurekalert.org. June 14, 2011. Retrieved November 14, 2013. ^ "Elongated mesocotyl1, a phytochrome-deficient mutant of maize". Brutnell Lab. Archived from the original on December 11, 2013. Retrieved December 7, 2013. ^ "ACES News :: College of ACES, University of Illinois". ^ "Corn Stalk Lodging" (PDF). Monsanto Imagine. October 2, 2008. Archived from the original (PDF) on February 25, 2009. Retrieved February 23, 2009. ^ Himi, E; Mares, DJ; Yanagisawa, A; Noda, K (2002). "Effect of grain color gene (R) on grain dormancy and sensitivity of the embryo to abscisic acid (ABA) in wheat". Journal of Experimental Botany. 53 (374): 1569–74. doi:10.1093/jxb/erf005. PMID 12096095. ^ Winkel-Shirley, B (2001). "Flavonoid biosynthesis. A colorful model for genetics, biochemistry, cell biology, and biotechnology". Plant Physiology. 126 (2): 485–93. doi:10.1104/pp.126.2.485. PMC 1540115. PMID 11402179. ^ a b Chopra, S; Cocciolone, SM; Bushman, S; Sangar, V; McMullen, MD; Peterson, T (2003). "The maize unstable factor for orange1 is a dominant epigenetic modifier of a tissue specifically silent allele of pericarp color1". Genetics. 163 (3): 1135–1146. PMC 1462483. PMID 12663550. ^ Dong, X; Braun, EL; Grotewold, E (2001). "Functional conservation of plant secondary metabolic enzymes revealed by complementation of Arabidopsis flavonoid mutants with maize genes". Plant Physiology. 127 (1): 46–57. doi:10.1104/pp.127.1.46. PMC 117961. PMID 11553733. ^ Lee, E.A. ; Harper, V (2002). "Suppressor of Pericarp Pigmentation 1 (SPP1), a novel gene involved in phlobaphene accumulation in maize (Zea mays L.) pericarps". Maydica. 47 (1): 51–58. INIST:13772300. ^ Grotewold, Erich; Drummond, Bruce J.; Bowen, Ben; Peterson, Thomas (1994). "The myb-homologous P gene controls phlobaphene pigmentation in maize floral organs by directly activating a flavonoid biosynthetic gene subset". Cell. 76 (3): 543–53. doi:10.1016/0092-8674(94)90117-1. PMID 8313474. ^ Irisch, Erin E. (1997). "CLASS II TASSEL SEED MUTATIONS PROVIDE EVIDENCE FOR MULTIPLE TYPES OF INFLORESCENCE MERISTEMS IN MAIZE (POACEAE)". American Journal of Botany. 84 (11): 1502–1515. doi:10.2307/2446611. JSTOR 2446611. ^ Montgomery E (1906). "What is an ear of corn?". Popular Science Monthly. 68 (January). ^ Kraig, Bruce (2012). Corn – Oxford Reference. doi:10.1093/acref/9780199734962.001.0001. ISBN 9780199734962. Retrieved 2017-12-04. ^ Brown, David (November 20, 2009). "Scientists have high hopes for corn genome". The Washington Post. ^ "Welcome to MaizeSequence.org". MaizeSequence.org. Retrieved September 21, 2013. ^ "Researchers sequence genome of maize, a key crop". Reuters. 2008-02-26. Retrieved October 6, 2014. ^ Schnable, P. S.; Ware, D.; Fulton, R. S.; et al. (2009). "The B73 Maize Genome: Complexity, Diversity, and Dynamics". Science. 326 (5956): 1112–5. Bibcode:2009Sci...326.1112S. doi:10.1126/science.1178534. PMID 19965430. ^ Feschotte, C.; Pritham, E. (2009). "A cornucopia of Helitrons shapes the maize genome". Proceedings of the National Academy of Sciences. 106 (47): 19747–19748. Bibcode:2009PNAS..10619747F. doi:10.1073/pnas.0910273106. PMC 2785235. PMID 19926864. ^ a b Rosenberg, Tina (April 9, 2014). "A Green Revolution, This Time for Africa". ^ a b c James, Clive (2016). "Global Status of Commercialized Biotech/GM Crops: 2016 – ISAAA Brief 52-2016". ISAAA. Archived from the original on 2017-05-04. Retrieved 2017-08-26. ^ "National Agricultural Statistics Service (NASS), Agricultural Statistics Board, US Department of Agriculture, Acreage report for 2010" (PDF). ^ "ISAAA Biotech Maize Update 2011" (PDF). Archived from the original (PDF) on May 24, 2013. Retrieved October 6, 2014. ^ "ISAAA Pocket K No. 2: Plant Products of Biotechnology, 2011". Retrieved October 6, 2014. ^ Andrew Pollack (September 23, 2000). "Kraft Recalls Taco Shells With Bioengineered Corn". The New York Times. ^ a b "Corn genetics study". U N I V E R S E. 2011-09-14. Retrieved October 6, 2014. ^ a b c Wilkes, Garrison (8 March 2004). "Chapter 1.1 Corn, strange and marvelous: but is a definitive origin known?". In Smith, C. Wayne; Betrán, Javier; Runge, E. C. A. Corn: Origin, History, Technology, and Production. John Wiley & Sons. pp. 3–63. ISBN 978-0-471-41184-0. ^ Hyams, Edward (1990). The Last of the Incas: The Rise and Fall of an American Empire. Dorset Press. ISBN 978-0-88029-595-6. ^ Doebley, John F. (2004). "The genetics of maize evolution" (PDF). Annual Review of Genetics. 38: 37–59. doi:10.1146/annurev.genet.38.072902.092425. PMID 15568971. ^ ""Wild grass became maize crop more than 8,700 years ago", National Science Foundation, News Release at Eurekalert March 24, 2009". March 23, 2009. Retrieved October 6, 2014. ^ a b Ranere, Anthony J.; Piperno, Dolores R.; Holst, Irene; et al. (2009). "The cultural and chronological context of early Holocene maize and squash domestication in the Central Balsas River Valley, Mexico" (PDF). Proceedings of the National Academy of Sciences. 106 (13): 5014–5018. Bibcode:2009PNAS..106.5014R. doi:10.1073/pnas.0812590106. PMC 2664064. PMID 19307573. ^ Ranere, Anthony J.; Piperno, Dolores R.; Holst, Irene; et al. (2009). "Starch grain and phytolith evidence for early ninth millennium B.P. maize from the Central Balsas River Valley, Mexico" (PDF). Proceedings of the National Academy of Sciences. 106 (13): 5019–5024. Bibcode:2009PNAS..106.5019P. doi:10.1073/pnas.0812525106. PMC 2664021. PMID 19307570. ^ Mann, Charles C. (July 2011). "Cotton (or Anchovies) and Maize". 1491: New Revelations of the Americas Before Columbus (2nd ed.). New York: Vintage Books. pp. 225–229. ISBN 978-1-4000-3205-1. ^ Diderot, Denis (2011-12-15). "Maize". Encyclopedia of Diderot & d'Alembert - Collaborative Translation Project. Retrieved April 1, 2015. ^ Van Devender, Karl (July 2011). "Grain Drying Concepts and Options" (PDF). University of Arkansas Division of Agriculture. Retrieved December 15, 2013. ^ International Grains Council (international organization) (2013). "International Grains Council Market Report 28 November 2013" (PDF). ^ "Maize production in 2014, Crops/Regions/Production Quantity from pick lists". United Nations, Food and Agriculture Organization, Statistics Division (FAOSTAT). 2014. Retrieved 4 April 2017. ^ a b c "Crop production, 2016" (PDF). US Department of Agriculture. 12 August 2016. Retrieved 4 April 2017. ^ Janssen, Kim (December 28, 2017). "Exciting days for corn lovers as corn to become official state grain of Illinois". Chicago Tribune. ^ "fall armyworm, Spodoptera frugiperda (J.E. Smith)". entnemdept.ufl.edu. Retrieved 2017-11-14. ^ Pechan, Tibor; Ye, Lijun; Chang, Yu-min; Mitra, Anurina; Lin, Lei; Davis, Frank M.; Williams, W. Paul; Luthe, Dawn S. (2000-07-01). "A Unique 33-kD Cysteine Proteinase Accumulates in Response to Larval Feeding in Maize Genotypes Resistant to Fall Armyworm and Other Lepidoptera". The Plant Cell. 12 (7): 1031–1040. doi:10.1105/tpc.12.7.1031. ISSN 1040-4651. PMC 149047. PMID 10899972. ^ "Chapter 8: Improvement of maize diets; from corporate document: Maize in human nutrition". United Nations Food and Agriculture Organization. 1992. Retrieved 5 June 2017. ^ Liggett, R. Winston; Koffler, H. (December 1948). "Corn steep liquor in microbiology". Bacteriological Reviews. 12 (4): 297–311. PMC 180696. PMID 16350125. ^ "Corn for Home Heat: A Green Idea That Never Quite Popped". 2015-03-02. Retrieved 2017-07-07. ^ Torres, Andres F.; Slegers, Petronella M.; Noordam-Boot, Cornelie M. M.; Dolstra, Oene; Vlaswinkel, Louis; van Boxtel, Anton J. B.; Visser, Richard G. F.; Trindade, Luisa M. (2016-03-15). "Maize feedstocks with improved digestibility reduce the costs and environmental impacts of biomass pretreatment and saccharification". Biotechnology for Biofuels. 9: 63. doi:10.1186/s13068-016-0479-0. ISSN 1754-6834. PMC 4791978. PMID 26981155. ^ "Fuel Ethanol Plants – Thermal Kinetics Engineering, PLLC". Thermal Kinetics Engineering, PLLC. Retrieved 2017-07-07. ^ Mark Clayton (January 28, 2008). "Christian Science Monitor". Christian Science Monitor. Retrieved October 6, 2014. ^ "Iowa Renewable Fuels Association". Archived from the original on October 11, 2014. Retrieved October 6, 2014. ^ "Revista Envío – Are Free Trade Agreements Free? Are They Development Strategies?". ^ "IBISWorld". Archived from the original on 2008-04-02. ^ "Maize Quest Fun Park: Corn Box". Archived from the original on October 12, 2007. Retrieved October 8, 2007. ^ "2009 US Corn Stats" (PDF). Iowa Corn. Retrieved December 2, 2010. ^ United States Department of Agriculture, Economic Research Service. Corn supply, disappearance, and share of total corn used for ethanol. www.ers.usda.gov/datafiles/US_Bioenergy/Feedstocks/table05.xls (Excel file, accessed June 29, 2015). ^ a b Hoffman, L. and A. Baker. 2011. Estimating the substitution of distillers'grains for corn and soybean meal in the U.S. feed complex. United States Department of Agriculture, Economic Research Service. FDS-11-l-01. 62 pp. ^ "National Nutrient Database for Standard Reference Release 28". United States Department of Agriculture: Agricultural Research Service. ^ "Nutrition facts, calories in food, labels, nutritional information and analysis". NutritionData.com. ^ "USDA Table of Nutrient Retention Factors, Release 6" (PDF). USDA. USDA. Dec 2007. ^ a b "Nutritional Effects of Food Processing". NutritionData.com. ^ "Nutrient data laboratory". United States Department of Agriculture. Retrieved August 10, 2016. ^ "The origins of maize: the puzzle of pellagra". EUFIC > Nutrition > Understanding Food. The European Food Information Council. December 2001. Archived from the original on September 27, 2006. Retrieved September 14, 2006. ^ Staller, John; Carrasco, Michael (24 November 2009). Pre-Columbian Foodways: Interdisciplinary Approaches to Food, Culture, and Markets in Ancient Mesoamerica. Springer Science & Business Media. p. 317. ISBN 978-1-4419-0471-3. ^ Thompson, Janice J.; Manore, Melinda; Vaughan, Linda (15 January 2016). "Nutrients involved in energy metabolism". The Science of Nutrition. Pearson Education. pp. 292–321. ISBN 978-0-13-429880-1. Also ISBN 978-0-321-64316-2. ^ Berrin, Katherine & Larco Museum. The Spirit of Ancient Peru: Treasures from the Museo Arqueológico Rafael Larco Herrera. New York: Thames and Hudson, 1997. ^ Croatian National Bank. Kuna and Lipa, Coins of Croatia Archived June 22, 2009, at the Wayback Machine: 1 Lipa Coin Archived June 28, 2011, at the Wayback Machine. Retrieved on March 31, 2009. Ferro, D.N. & Weber, D.C. "Managing Sweet Corn Pests in Massachusetts". Bonavia, Duccio (13 May 2013). Maize: Origin, Domestication, and Its Role in the Development of Culture. Cambridge University Press. ISBN 978-1-107-02303-1. "Zea mays". Germplasm Resources Information Network (GRIN). Agricultural Research Service (ARS), United States Department of Agriculture (USDA). "Maize" . New International Encyclopedia. 1905. Arepa (Spanish pronunciation: [aˈɾepa]) is a type of food made of ground maize dough, originating from pre-Columbian northern region of South America, and is notable in the cuisines of Colombia and Venezuela.It is eaten daily in those countries and can be served with accompaniments such as cheese, cuajada (fermented milk), various meats, chicken, avocado, and diablito. It can also be split to make sandwiches. Sizes, maize types, and added ingredients vary its preparation. Arepas can also be found in the Canary Islands. It is similar in shape to the Mexican gordita and the Salvadoran pupusa. Barbara McClintock (June 16, 1902 – September 2, 1992) was an American scientist and cytogeneticist who was awarded the 1983 Nobel Prize in Physiology or Medicine. McClintock received her PhD in botany from Cornell University in 1927. There she started her career as the leader in the development of maize cytogenetics, the focus of her research for the rest of her life. From the late 1920s, McClintock studied chromosomes and how they change during reproduction in maize. She developed the technique for visualizing maize chromosomes and used microscopic analysis to demonstrate many fundamental genetic ideas. One of those ideas was the notion of genetic recombination by crossing-over during meiosis—a mechanism by which chromosomes exchange information. She produced the first genetic map for maize, linking regions of the chromosome to physical traits. She demonstrated the role of the telomere and centromere, regions of the chromosome that are important in the conservation of genetic information. She was recognized as among the best in the field, awarded prestigious fellowships, and elected a member of the National Academy of Sciences in 1944. During the 1940s and 1950s, McClintock discovered transposition and used it to demonstrate that genes are responsible for turning physical characteristics on and off. She developed theories to explain the suppression and expression of genetic information from one generation of maize plants to the next. Due to skepticism of her research and its implications, she stopped publishing her data in 1953. Later, she made an extensive study of the cytogenetics and ethnobotany of maize races from South America. McClintock's research became well understood in the 1960s and 1970s, as other scientists confirmed the mechanisms of genetic change and genetic regulation that she had demonstrated in her maize research in the 1940s and 1950s. Awards and recognition for her contributions to the field followed, including the Nobel Prize in Physiology or Medicine, awarded to her in 1983 for the discovery of genetic transposition; she is the only woman to receive an unshared Nobel Prize in that category. In South and Central America, chicha is a fermented (alcoholic) or non-fermented beverage usually derived from grains, maize, or fruit., Chicha includes corn beer, known as chicha de jora, and non-alcoholic beverages such as chicha morada. Archaeobotanists have found evidence for chicha made from maize, the fruit of Schinus molle and Prosopis pods. Chichas can also be made from quinoa, kañiwa, peanut, manioc root (also called yuca or cassava), palm fruit, potato, Oxalis tuberosa, chañar or various other fruits.While chicha is most commonly associated with maize, the word is used in the Andes for almost any homemade fermented drink, and many unfermented drinks. Many different maize landraces, grains or fruits have been and can be used to make chicha in different regions. The way in which chicha is made and defined is likely to change depending on the region. Corn starch or maize starch is the starch derived from the corn (maize) grain. The starch is obtained from the endosperm of the kernel. Corn starch is a common food ingredient, used in thickening sauces or soups, and in making corn syrup and other sugars. It is versatile, easily modified, and finds many uses in industry as adhesives, in paper products, as an anti-sticking agent, and textile manufacturing. It has medical uses, such as to supply glucose for people with glycogen storage disease.Like many products in dust form, it can be hazardous in large quantities due to its flammability. When mixed with a fluid, cornstarch can rearrange itself into a non-Newtonian fluid. For example, adding water transforms cornstarch into a material commonly known as Oobleck while adding oil transforms cornstarch into an electrorheological (ER) fluid. The concept can be explained through the mixture termed "cornflour slime". Corn syrup is a food syrup which is made from the starch of corn (called maize in some countries) and contains varying amounts of maltose and higher oligosaccharides, depending on the grade. Corn syrup, also known as glucose syrup to confectioners, is used in foods to soften texture, add volume, prevent crystallization of sugar, and enhance flavor. Corn syrup is distinct from high-fructose corn syrup (HFCS), which is manufactured from corn syrup by converting a large proportion of its glucose into fructose using the enzyme D-xylose isomerase, thus producing a sweeter compound due to higher levels of fructose. The more general term glucose syrup is often used synonymously with corn syrup, since glucose syrup in the United States is most commonly made from corn starch. Technically, glucose syrup is any liquid starch hydrolysate of mono-, di-, and higher-saccharides and can be made from any source of starch; wheat, tapioca and potatoes are the most common other sources. In North America and Central America, a corn tortilla or just tortilla (, Spanish: [toɾˈtiʎa]) is a type of thin, unleavened flatbread, made from powdered hominy (nixtamalized maize (corn)). In Guatemala and Mexico, there are three colors of maize dough for making tortillas: white maize, yellow maize and blue maize (or black maize). A similar bread from South America, called arepa (though arepas are typically much thicker than tortillas), predates the arrival of Europeans to America, and was called tortilla by the Spanish from its resemblance to the traditional Spanish round, unleavened cakes and omelettes (originally made without potatoes, which are native to South America). The Aztecs and other Nahuatl-speakers call tortillas tlaxcalli ([t͡ɬaʃˈkalli]); these have become the prototypical tortillas. Maize kernels naturally occur in many colors, depending on the cultivar: from pale white, to yellow, to red and bluish purple. Likewise, corn meal and the tortillas made from it may be similarly colored. White and yellow tortillas are by far the most common, however. Cornmeal is a meal (coarse flour) ground from dried maize (corn). It is a common staple food, and is ground to fine, medium, and coarse consistencies, but not as fine as wheat flour. In the United States, very finely ground cornmeal is referred to as corn flour. When fine cornmeal is made from maize that has been soaked in an alkaline solution, e.g., limewater (a process known as nixtamalization), it is called masa harina, which is used for making tamales and tortillas. Boiled cornmeal is called polenta in Italy and is also a traditional dish and bread substitute in Romania. Fodder, a type of animal feed, is any agricultural foodstuff used specifically to feed domesticated livestock, such as cattle, rabbits, sheep, horses, chickens and pigs. "Fodder" refers particularly to food given to the animals (including plants cut and carried to them), rather than that which they forage for themselves (called forage). Fodder () is also called provender () and includes hay, straw, silage, compressed and pelleted feeds, oils and mixed rations, and sprouted grains and legumes (such as bean sprouts, fresh malt, or spent malt). Most animal feed is from plants, but some manufacturers add ingredients to processed feeds that are of animal origin. The worldwide animal feed industry produced 873 million tons of feed (compound feed equivalent) in 2011, fast approaching 1 billion tonnes according to the International Feed Industry Federation, with an annual growth rate of about 2%. The use of agricultural land to grow feed rather than human food can be controversial; some types of feed, such as corn (maize), can also serve as human food; those that cannot, such as grassland grass, may be grown on land that can be used for crops consumed by humans. In many cases the production of grass for cattle fodder is a valuable intercrop between crops for human consumption, because it builds the organic matter in the soil. Some agricultural byproducts fed to animals may be considered unsavory by human consumers. Genetically modified maize (corn) is a genetically modified crop. Specific maize strains have been genetically engineered to express agriculturally-desirable traits, including resistance to pests and to herbicides. Maize strains with both traits are now in use in multiple countries. GM maize has also caused controversy with respect to possible health effects, impact on other insects and impact on other plants via gene flow. One strain, called Starlink, was approved only for animal feed in the US, but was found in food, leading to a series of recalls starting in 2000. Grits is a food made from a dish of boiled cornmeal. Hominy grits are a type of grits made from hominy – corn that has been treated with an alkali in a process called nixtamalization with the pericarp removed. Grits are often served with other flavorings as a breakfast dish, usually savory. The dish originated in the Southern United States but now is available nationwide, and is popular as the dinner entrée shrimp and grits, served primarily in the South. Grits should not be confused with boiled ground corn, which makes "hasty pudding" or "mush" or may be made into polenta using coarse ground corn, or with the "mush" made from more finely ground corn meal. Grits is of Native American origin and is similar to other thick maize-based porridges from around the world, such as polenta and mieliepap. The word "grits" is derived from the Old English word "grytt," meaning coarse meal. High-fructose corn syrup (HFCS), also known as glucose-fructose, isoglucose and glucose-fructose syrup, is a sweetener made from corn starch. As in the production of conventional corn syrup, the starch is broken down into glucose by enzymes. To make HFCS, the corn syrup is further processed by glucose isomerase to convert some of its glucose into fructose. HFCS was first marketed in the early 1970s by the Clinton Corn Processing Company, together with the Japanese Agency of Industrial Science and Technology where the enzyme was discovered in 1965.As a sweetener, HFCS is often compared to granulated sugar, but manufacturing advantages of HFCS over sugar include that it is easier to handle and more cost-effective. The United States Food and Drug Administration has determined that HFCS is a safe ingredient for food and beverage manufacturing, where "HFCS 42" refers to 42% and "HFCS 55" to 55% fructose composition in manufacturing, respectively. HFCS 42 is mainly used for processed foods and breakfast cereals, whereas HFCS 55 is used mostly for production of soft drinks.There is debate over whether HFCS presents greater health risks than other sweeteners. The number of uses and exports of HFCS from American producers have grown steadily during the early 21st century. La Villeneuve-Bellenoye-et-la-Maize is a commune in the Haute-Saône department in the region of Bourgogne-Franche-Comté in eastern France. Maya mythology is part of Mesoamerican mythology and comprises all of the Maya tales in which personified forces of nature, deities, and the heroes interacting with these play the main roles. The myths of the Pre-Hispanic era have to be reconstructed from iconography. Other parts of Maya oral tradition (such as animal tales, folk tales, and many moralising stories) are not considered here. Polenta (Italian pronunciation: [poˈlɛnta]) is a dish of boiled cornmeal that was historically made from other grains. It may be served as a hot porridge, or it may be allowed to cool and solidify into a loaf that can be baked, fried, or grilled. Popcorn (popped corn, popcorns or pop-corn) is a variety of corn kernel, which expands and puffs up when heated. A popcorn kernel's strong hull contains the seed's hard, starchy endosperm with 14–20% moisture, which turns to steam as the kernel is heated. Pressure from the steam continues to build until the hull ruptures, allowing the kernel to forcefully expand from 20 to 50 times its original size—and finally, cool.Some strains of corn (taxonomized as Zea mays) are cultivated specifically as popping corns. The Zea mays variety everta, a special kind of flint corn, is the most common of these. The six major types of corn are chops, dent corn, flint corn, pod corn, popcorn, flour corn, and sweet corn. Porridge (also historically spelled porage, porrige, parritch) is a food commonly eaten as a breakfast cereal dish, made by boiling ground, crushed or chopped starchy plants—typically grain—in water or milk. It is often cooked or served with added flavorings such as sugar, honey, fruit or syrup to make a sweet cereal or mixed with spices or vegetables to make a savoury dish. It is usually served hot in a bowl. Sorghum is a genus of flowering plants in the grass family Poaceae. Seventeen of the 25 species are native to Australia, with the range of some extending to Africa, Asia, Mesoamerica, and certain islands in the Indian and Pacific Oceans. One species is grown for grain, while many others are used as fodder plants, either cultivated in warm climates worldwide or naturalized, in pasture lands. Sorghum is in the subfamily Panicoideae and the tribe Andropogoneae (the tribe of big bluestem and sugarcane). The Three Sisters are the three main agricultural crops of various Native American groups in North America: winter squash, maize (corn), and climbing beans (typically tepary beans or common beans). Originating in Mexico, these three crops were carried northward, up the river valleys over generations of time, far afield to the Mandan and Iroquois who, among others, used these "Three Sisters" as trade goods. In a technique known as companion planting the three crops are planted close together. Flat-topped mounds of soil are built for each cluster of crops. Each mound is about 30 cm (12 in) high and 50 cm (20 in) wide, and several maize seeds are planted close together in the center of each mound. In parts of the Atlantic Northeast, rotten fish or eels are buried in the mound with the maize seeds, to act as additional fertilizer where the soil is poor. When the maize is 15 cm (6 inches) tall, beans and squash are planted around the maize, alternating between the two kinds of seeds. The process to develop this agricultural knowledge took place over 5,000–6,500 years. Squash was domesticated first, with maize second and then beans being domesticated. Squash was first domesticated 8,000–10,000 years ago.The three crops benefit from each other. The maize provides a structure for the beans to climb, eliminating the need for poles. The beans provide the nitrogen to the soil that the other plants use, and the squash spreads along the ground, blocking the sunlight, helping prevent the establishment of weeds. The squash leaves also act as a "living mulch", creating a microclimate to retain moisture in the soil, and the prickly hairs of the vine deter pests. Corn, beans, and squash contain complex carbohydrates, essential fatty acids and all nine essential amino acids, allowing most Native American tribes to thrive on a plant-based diet.Native Americans throughout North America are known for growing variations of Three Sisters gardens. The milpas of Mesoamerica are farms or gardens that employ companion planting on a larger scale. The Ancestral Puebloans are known for adopting this garden design in a drier environment. The Tewa and other peoples of the Southwestern United States often included a "fourth Sister", Rocky Mountain bee plant (Cleome serrulata), which attracts bees to help pollinate the beans and squash.The Three Sisters planting method is featured on the reverse of the 2009 US Sacagawea dollar. Note: All nutrient values including protein and fiber are in %DV per 100 grams of the food item. Significant values are highlighted in light Gray color and bold letters. Cooking reduction = % Maximum typical reduction in nutrients due to boiling without draining for ovo-lacto-vegetables group Q = Quality of Protein in terms of completeness without adjusting for digestability.